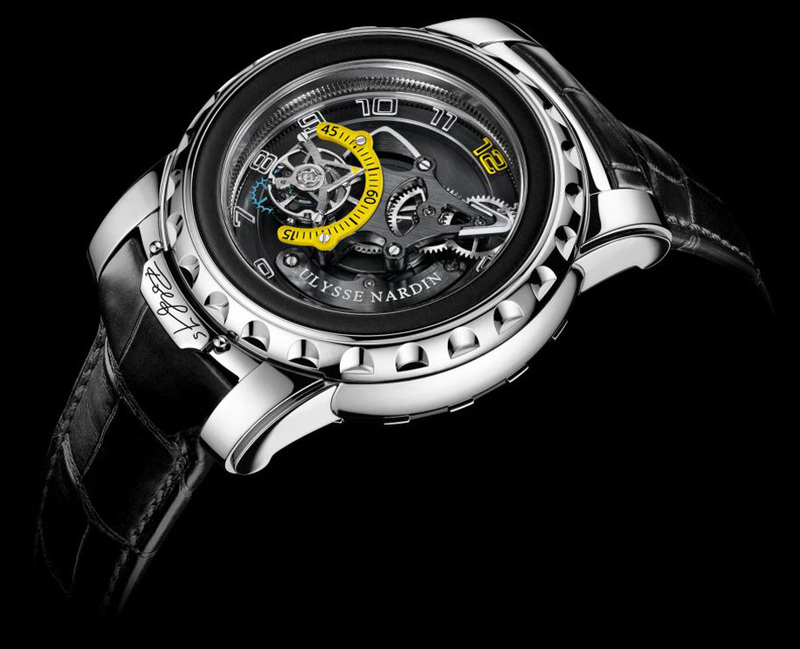 Rolf Schnyder, the owner and president of Ulysse Nardin, turned 75 this year, and to commemorate his many achievements, he decided to introduce a new limited edition Freak Diavolo. 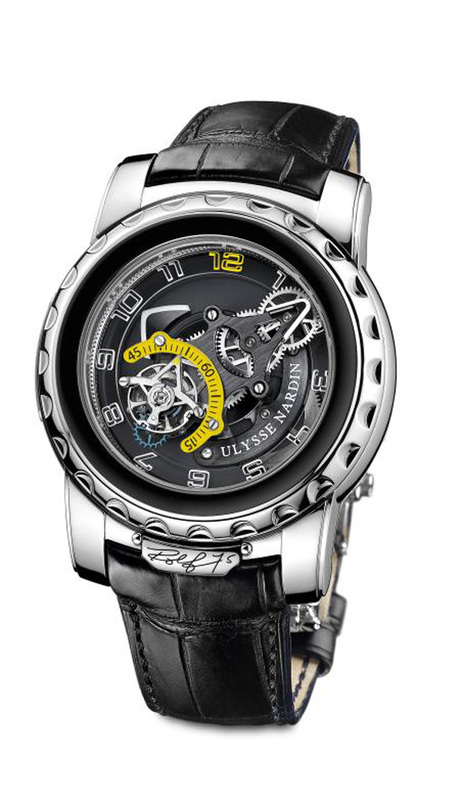 Ulysse Nardin Freak Diavolo Rolf 75 features highly technological advancements, and is made from high-quality materials. It is a fitting commemorative piece because when it was first launched in 2001 ‘the Freak’ shook up the watchmaking industry with its carrousel tourbillion without crown, hands, or dial and with a novel silicium escapement which required no lubrication. Not to mention that it was the first silicum escapement wheel in watchmaking — and silicum was more or less unheard of in watchmaking at the time. 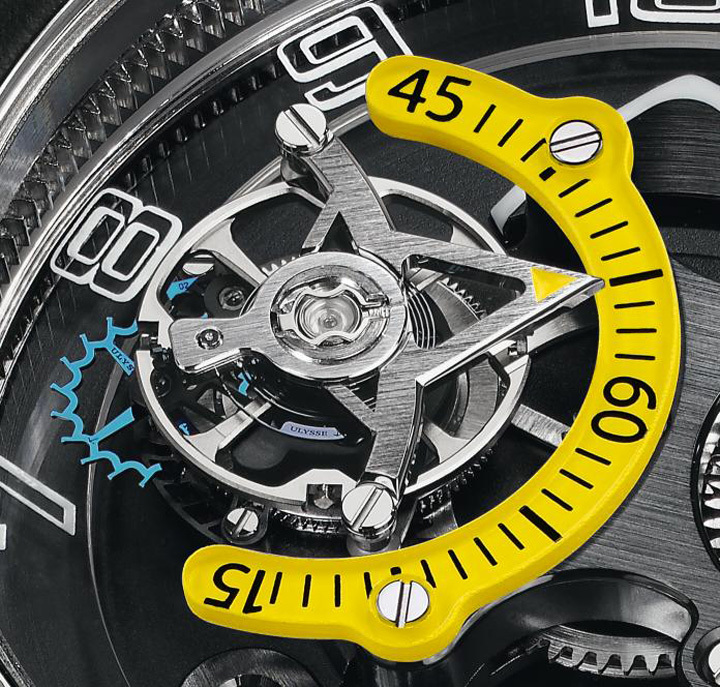 The new timepiece features a flying tourbillon indicating the seconds, that has a cage fitted with an arrow pointing to the seconds on a yellow half-circle that rotates in one minute on itself, with the ‘0′ position keeping steady on the minute indicator axis. The brand’s tourbillon carrousel rotates around the center in 60 minutes. A limited edition of 75 pieces, the Ulysse Nardin Freak Diavolo Rolf 75 watch has a power reserve of more than 8 days, silicium hairspring, frequency of 4 Hz (28′800 A/h), 8 mg*cm2 inertia balance wheel, forward and backward time setting over the bezel and manual winding over the bezel on the back of the case. One full rotation is equivalent to 12 hours of power reserve.